Niall McGinn scored twice as Aberdeen comfortably overcame Dundee 3-0 at Pittodrie to climb above Rangers into second spot in the Scottish Premiership. The Northern Irishman netted in each half after Ryan Jack had powered in a header to send the Dons on their way to a fourth straight league win. Ryan Christie, who this week completed a loan move from Celtic, came off the bench late on to make his debut after Derek McInnes fielded an unchanged line-up for the fifth consecutive game. Dundee made a lively start and Paul McGowan was desperately unlucky not to give them a 10th-minute lead when he spotted Joe Lewis off his line and sent a stunning 25-yard volley over the goalkeeper only for the ball to rattle the crossbar. It was Aberdeen's turn to be denied by the frame of the goal in the 16th minute, Jonny Hayes delivering an inswinging cross which flashed past a ruck of bodies before striking the far post. 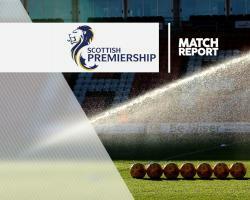 Although an offside decision ruled out a Craig Wighton strike for Dundee, the Dons began to exert pressure on their opponents and after McGinn twice forced saves from Scott Bain, the Northern Irishman carved out the opener in the 29th minute. McGinn turned Nick Ross inside out and stood up a cross for the onrushing Jack to bullet home a 10-yard header. Bain made a great stop to deny the Dons doubling their advantage in the 35th minute, Adam Rooney hooking the ball into the path of Kenny McLean and the visiting goalkeeper spreading himself to pull off the save. From Ash Taylor's knockdown, McGinn controlled the ball on his right thigh 20 yards out and smashed a stunning left-foot volley in off the far post. Slack Dundee defending almost gifted Aberdeen a third in the 58th minute as Rooney's quickly taken throw sent McLean clear although he was unable to beat Bain from a tight angle. Moments later, Bain was called into action again to keep out Graeme Shinnie's low drive, which rebounded back out for Rooney but the striker could not direct the ball on target. Bain was in inspired form against his former club, foiling Rooney after unselfish work from Hayes in the 68th minute. Dundee's threat was minimal, with substitute Faissal El Bakhtaoui having their best effort with a 20-yard drive which flew past a post. But with 10 minutes remaining McGinn, the game's stand-out player, put the seal on an impressive home win with a header from a delightful Hayes cross.